Kasco Marine LED3S19-050 Waterglow Fountain LED Light Kit, Stainless Steel Housing, 3 Lights, 50' Cord - 19 Watt Fixtures | Fountain City Art Ctr. The ultimate lighting solution for your Kasco J and VFX Series Fountains and AF Series Surface Aerators. This 3 fixture kit features durable stainless steel housings. Each 19 watt, low-voltage fixture delivers a classic white color and is rated at nearly 1,700 lumens. Each kit comes standard with blue, amber, red and green lenses and rubber lens cap. 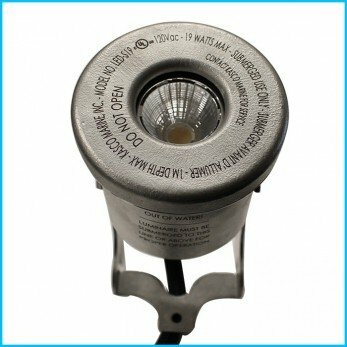 These lights run on standard 60Hz power and are UL listed and CSA certified. These durable and flexible lights will add nighttime drama and beauty to any water feature. This particular model comes with a 50' cord.